Uncapped pair Lauren Cheatle and Tahlia McGrath have recovered from injury and are in Australia's 15-strong Test squad for the Women's Ashes. McGrath, 21, played her first match in eight months on October 6 following a stress fracture in pre-season. Ashleigh Gardner, Belinda Vakarewa, Amanda-Jade Wellington and Beth Mooney are the other uncapped squad members. Left-arm quick Cheatle and all-rounder Tahlia McGrath are in both the one-day and the Test squads, with the latter set to be reduced to 13 following a three-day pink-ball warm-up against an ACT XI next month. Fast bowler Vakarewa is the only player named in the Test squad who isn't also in the one-day pool. 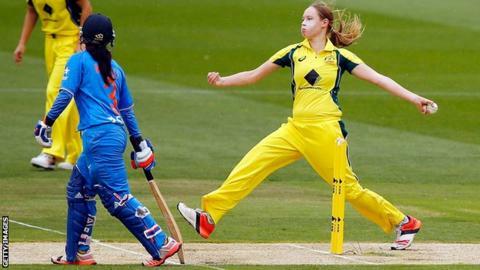 Former captain Meg Lanning is missing with a shoulder surgery that will rule her out for up to eight months so the side will be led by 30-year-old batsman Rachael Haynes. National selector Shawn Flegler said: "This was a really tough selection process for the panel with some talented players missing out, but we're confident we have selected a balanced side that has the potential to beat England and retain the Ashes. "This series presents a golden opportunity for the team to reinstate themselves as the number one-ranked side in the world." Heather Knight's England will look to regain the Ashes in the multi-format series that begins on 22 October with a one-day international in Brisbane. Points are awarded across three one-day internationals, one Test and three Twenty20s. Australia Test squad: Kristen Beams, Alex Blackwell, Nicole Bolton, Lauren Cheatle, Ashleigh Gardner, Rachael Haynes, Alyssa Healy, Jess Jonassen, Tahlia McGrath, Beth Mooney, Ellyse Perry, Megan Schutt, Belinda Vakarewa, Elyse Villani, Amanda-Jade Wellington. Australia ODI squad: Beams, Blackwell, Bolton, Cheatle, Gardner, Haynes, Healy, Jonassen, McGrath, Mooney, Perry, Schutt, Villani, Wellington.